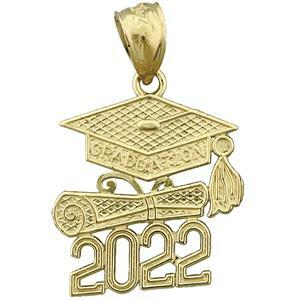 Complement your graduation jewelry collection with this charming 14k gold 2018 graduation diploma & cap charm featuring finite & artistic details. Charm is measured approximately 9/16" wide by 5/8 " high and weighs 1.8 gram(s). Tell us what you think about this product. Select a rating, and add your own opinions and experiences to help other customers make an informed buying decision. ● Allow 3 to 5 days for us to review and approve your review. ● Negative posts are allowed, but please do not use offensive or abusive language. ● We reserve the right to edit offensive content, up to and including refusing to post a review that is offensive or abusive.